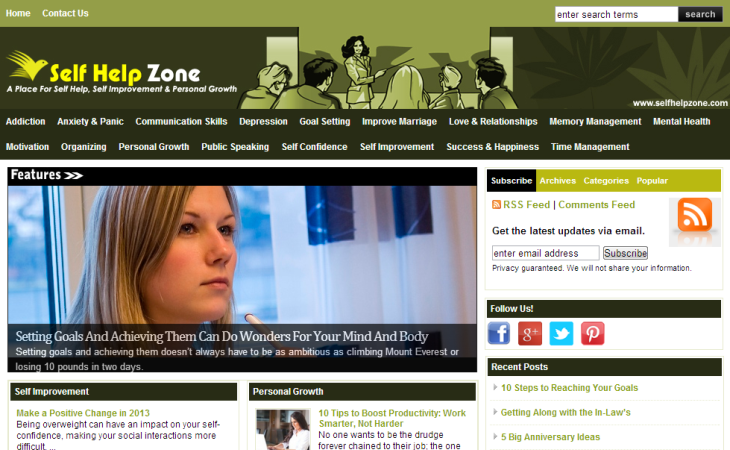 Selfhelpzone.com was launched keeping in mind the increasing need for self help technique in today’s world. We understand the havoc that external stresses are creating in an average human’s life. At selfhelpzone.com we hope to alleviate the effects stress through our articles that guide people through the difficult phases of life. The difficulty could be as mundane as achieving work-life balance or more serious issues like substance abuse and addiction. The site has developed a strong database of articles that address all these issues with equanimity. It focuses on self development skills and goes on to feature relationship issues and psychological problems that are plaguing the society.